When dessert is just as beautiful as it is tasty, it tends to make you crave it more. We see Chocolatiers around the world create beautiful works of art with chocolate from scratch. But did you know you can make your own chocolate accents at home with just one simple tool? We know people love using wax seals to package their products. It adds a unique signature and makes a wonderful presentation. Well you can also do the same for desserts. 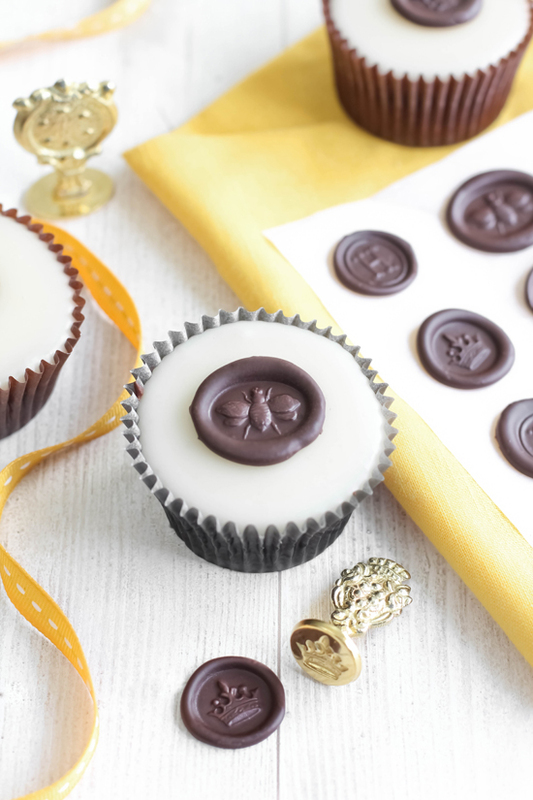 Chocolate seals are easy to make and can turn a simple cupcake into an extraordinary one. Here is how you can take a wax seal stamp and create your own chocolate seals for decoration. Heat up the chocolate. You can do this by using a double boiler or a microwave. When using a microwave, heat the chocolate in a microwave safe for 30 seconds. Remove bowl and stir. Place the bowl back in the microwave and continue to heat at 30 second intervals, stirring between each, until chocolate is completely melted. Be careful not to overheat. Let the chocolate stand for 3-5 minutes. The chocolate should be slightly warm. If the chocolate is too hot, the impression will smear when you try to stamp it. While you wait for the chocolate to cool a bit, place your wax stamp in the cup of ice. It is important that the bottom of the wax stamp is thoroughly chilled. This will prevent the chocolate from sticking to the stamp. Line your baking sheet with parchment paper and pour the chocolate into a piping bag. Squeeze dime size amounts of chocolate on to the parchment paper. Remove your stamp from the ice and quickly wipe dry with a towel. Place the stamp gently in the mound of chocolate.Let it stand for just a few seconds (no more than 5). Press down again very gently but firmly once more before lifting the stamp. Voila! You should be left with a clear impression of the stamp design in chocolate. Chill the stamp in ice between each batch of the remaining chocolate. Refrigerate the seals until ready for use! Any Wax Seal Stamp can be used for chocolate-just do remember to keep the design fairly basic and not too intricate. Texts can be done but must be fairly thick and not using much text. Chocolate does not take details quite as well as wax.